June 7-10 As I put on Facebook, Desert Rocks music festival was one of the best and worst times of my life rolled into one event! As first time festival goers, Jim and I weren't completely prepared for our adventure. Live and learn. 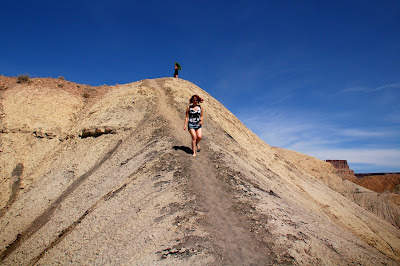 With anxious anticipation we made our way to Jenk Star Ranch on Thursday, where Desert Rocks was being held this year. One of our tickets was bought through an online benefit auction but when we got to the ticket booth, they didn't have a clue what we were talking about. They took us to another area, they had no clue, thankfully the next people knew what was going on and we received our other wrist band. This was our first taste of the lack of organization of the whole festival. Before leaving for this adventure, we were told by a concerned family member that "Desert Rocks isn't going to be like campmeeting," a church camp from our younger days. This quickly became our catchphrase for the weekend. "This isn't campmeeting!" Next we had to find a place to set up camp. On the website map, it showed two separate places for car campers. When we arrived, they didn't have the one we wanted open which would have provided some bit of shade in the late afternoon and maybe a tiny bit of a windbreak. Disappointed we drove toward the open sites. At first glance, it looked as if there were no open sites but after driving around a little, we realized that there were no set camping sites and it was a complete free for all, having to just find a place to fit your camp into. "This definitely isn't campmeeting." At the edge of the gathering we found a tiny bush, almost the only one around, that would give a touch of privacy. Although we quickly found out there's no such thing as privacy at a festival. As soon as we stopped, one of the Nazi-security guys came running over and told us we were not in the designated camping area. Frustrated, we drove on. Finally we found a place next to a tiny bump of a hill to wedge ourselves into a microscopic space between two other camps, one with a huge shade structure, the other with a tight huddle of tents and tarps. 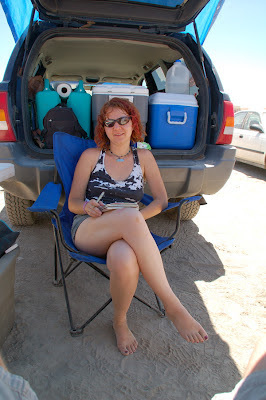 Tentatively we set up camp, in the searing hot sun, hoping our neighbors wouldn't mind. We sat in our camp chairs in the shade of our tent to decompress and just take it all in. Since we did not receive any kind of map or schedule of events, we set out to explore. 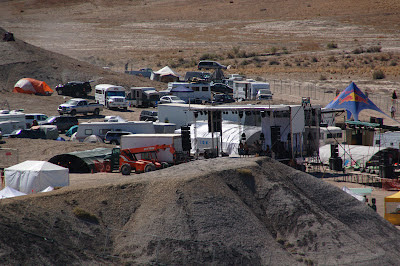 The main festival area was surrounded by a fence and it took a bit of searching to find the one and only gate entrance that was unconveniently located a fair distance from the main camping area. At the gate, the Nazi-security struck again. Not only did they look through my bag searching for contraband beer, they opened my water bottle and sniffed it... they SNIFFED it. I tossed a confused look and a quiet "this ain't campmeeting" at Jim and we walked through the gate trying to suppress our giggles. Entrance Gate: unique structure to the far right. Consciousness content tents: center. Lunar stage: bottom white structure. Slowly we wandered around taking in all the sights: we passed all the vendor tents, passed the huge two main Earth and Sun stages, passed all the food vendors, around a hill over toward the consciousness content tents, the SolLun, and the smaller Cosmic stage. There wasn't a lot happening yet so we went back to camp. Before long, another couple came looking for a camp spot, being seasoned festival goers, they confidently pulled up between our vehicle and our neighbor's vehicle, in front of their shade structure, and started setting up their tent. Soon we were talking with Jessica and Cory like long lost friends. That was one of my favorite things about Desert Rocks. The people. It was such an eclectic mix of subcultures yet everyone was so friendly and welcoming. Differences were put aside for this shared experience. Observing this throughout the weekend put a smile on my face. Wouldn't the world be vastly different if everyday life on Earth could be our 'shared experience' that brought us ALL together. It was getting dark so I donned my glowing, star head-boppers and bracelets, and off we went to our first night of live music and dancing. We found some music we liked and worked our way through the crowd. Since we didn't have a schedule, I don't know who we were listening to. Over to the side, between the two main stages, some movement caught my eye. A woman was making her way up the breezy fabric attached to a lofty metal frame set up for aerial-dancers. Jim and I pressed closer. She flowed and danced with such grace. At the bottom, a man was getting ready for his performance. The fabric was pulled to the side and in an instant he was spinning a staff of fire. Soon he was joined by other fire dancers: a fire sword, poi juggling, more fire staffs. Magic began. I was mesmerized by the spinning, golden, orange flames; the music reverberating in my body. The crowd around me felt it too. Energy of this moment was strong, we were all one. I was part of the fire, part of the soft dirt under my feet, part of the breeze blowing my hair, part of the river flowing nearby, part of the stars watching from above and so was everyone around me. Swaying, moving, dancing, and breathing together as one. You may think I was under mind altering substances, but this was definitely not the case. It was the energetic, spiritual, connection that binds all together. As quickly as it began, it ended, and everyone dispersed to other stages. Jim and I decided we didn't want to be out too late since it was only the first night so we went back to camp. Sleep was illusive; the music was loud and people's excitement surrounded us. A couple hours later, our neighbors with the shade structure returned and it sounded like they were joined by many more: tents were put up, vehicles were moving, coolers were opened and shut, there were shouts after someone was almost run over, and the tale was told time and again. As I faded in and out of sleep I hoped their vehicles were not close to our tent, yet didn't have the energy to make sure. Jim remembered the earplugs he brought for us and I was out for the rest of the night, oblivious to anything around me. I awakened in a daze, in our hot, sticky, suffocating tent. A buzz of activity already around us. I felt a little anxious with a need for privacy. I wanted to hide out in the tent but the cool morning breeze called me out. I sat in the corner between our tent, table, and jeep while I slathered on sunscreen already feeling the burn of the morning sun. After breakfast, and feeling a little more brave, we met our growing group of neighbors. They were actually from a band that would be playing later in the day, Tony Holliday and the Velvetones. Listening to their banter was hilarious and kept me giggling the whole weekend. They were the comic relief amidst the hellish parts of the event. Since there was no cell service, Jim and I hiked up a hill to call home and talk to the girlies. They happily chattered away but were doing well in grandma's care and were excited to get back to playing. The view of the whole grounds was awesome from the top of the hill. The breeze was starting to pick up a little and we could see the soft dirt swirling around below. Back at camp the heat was already becoming unbearable so we stretched a tarp from our tent to the jeep to make a great little relaxing place. It almost felt like we should go do something, go check out what was happening at the main grounds, go, go, go, but we realized that just hanging out at camp together, relaxing, talking, and people watching really was okay. It was okay to just put our feet in the sand and relax, so we did, and we completely enjoyed it. The river was calling to us that afternoon so we put out our large water jugs to reserve our parking space and headed out. The water was so refreshing, cooling and renewing. It was so nice to just sit in the water and let it wash away the dirt and heat of the day. 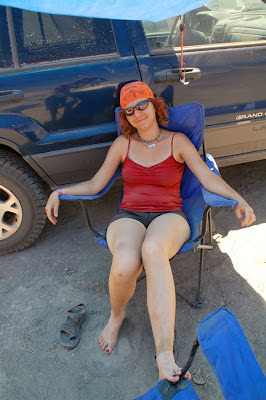 Then we found a secluded place to nap in the shade. Later we ran to town to get ice and ice cream, and headed back to camp. As we approached our camp, we found that our parking space had been over taken by a vehicle, two tents, and another tent in the process of going up. "What are they doing?!? Didn't they SEE our reserved spot?? Why didn't anyone tell them that was our space?? How are we going to park by our tent?!?" We got out to decide what to do. There was a little bit of space between the bump of a hill and all the other campers so Jim pulled the Jeep through there to park by our tent. I was concerned we would be blocked in and not be able to leave when it was time but we decided to not worry about it until the time came. Frustrations quickly melted. The vehicle and closest tents belonged to two girls that were with the band camped behind us. Maya was rushing around getting the other tent put up while spouting loud colorful language. I was sure she hated us but amidst the flurry of activity she stopped to introduce herself. She stretched out her hand but quickly pulled it back and said, "What the hell is this? We don't shake hands at a festival, we hug!" After sharing and comparing past experiences, ideals, drinks, finding things in common, and getting to know all our new friends better, we headed over to get our dance on again. First was a mix between a non-religious, protestant revival and hip-hop at Brother Ali's performance. It was different but fun. Later we enjoyed Phadroid's show which included psychedelic, digital art projected onto a flag dancer in white, set to electronica music. Last, we danced like no one was watching with Beats Antique. There were others mixed in there too but these were the most memorable. Saturday can pretty much be accurately illustrated by wind, dirt, heat, blasting, sand, sun, dirt, dry, and more wind and dirt: gusts of hot blasting typhoonish wind all day. Seriously, we sat either under a flapping tarp or in the Jeep ALL. DAY. LONG. It sucked. This was definitely not campmeeting! We should have gone to the river. We watched a huge multistory tall pyramid tent get swept up into the sky and go tumbling. We saw a multitude of items being blown through the campground. Tents, shade structures, and gear was broken and tattered. The feeling was oppressive and defeating. When the one cloud of the day drifted across the sun, cheers were heard throughout the grounds along with a shout of "thank you cloud!" Covered in dirt from head to toe! That late afternoon I pulled together any shreds of courage I could find, tied a knee sock around my face, and Jim and I headed out to see what was happening at the main grounds. Atomga was playing their lively afrobeat sounds to a small group. We got a snow-cone and listened in for a bit but it wasn't his favorite so we went back to camp. At the end of our snow-cone I was amazed at the amount of dirt in the bottom, although I shouldn't have been. I don't think I can accurately portray the exorbitant amount of dirt that I experienced through the weekend. Jessica and Cory were just arriving back from their relaxing day at the park, a place we totally should have gone, and was excited to catch Chali 2na's show. We went along and had a total blast while getting sand blasted. Chali kept the huge crowd's energy ramped up and moving despite the crazy conditions. I love live concerts for this reason. The performers' ability to bring so many people together, help them to let go of their cares, and just enjoy the moment of this shared experience is fascinating to me. Just as that show was wrapping up, the wind began blowing even harder, changed direction and became colder. We rushed back to camp to secure everything. We thought it would be ridiculous to try to sleep in the tent so we quickly moved things around, put our bed in the back of the jeep, and hung out there for a while. There was another show we wanted to see so we pulled out all our warmer clothes and my glow goodies, connected with Jessica and Cory, and went forth into the blizzard-like sand storm. We thought the wind was bad earlier in the day but that was nothing compared to this! I had to keep my sunglasses on, even though it was dark, to protect my eyes. Shortly after passing through Nazi-security at the gate again, we found the music had been canceled until the storm let up. We agreed to have an awesome time despite the situation so we headed to see if anything was happening at the SolLun. The partial enclosure offered some protection against the storm while the SolarSaucer provided awesome beats to dance to if you could find room in the full house. Later we continued on in search of adventure, huddled together against the freezing, blasting, dirt hurricane. We poked our heads into some large tents and domes but didn't find what we were looking for until we were almost back to our campsite. Inside a smaller dome, a huge gathering of people were squeezed in, listening to a funky, bluesy set. It was warm but there wasn't even room to breathe let alone dance. It was getting late, or early I should say, so Jim and I headed to bed. I was completely covered in dirt. It was in my ears, eyebrows, eyelashes, hair, and all over, but I was too tired to care so I quickly drifted off to sleep. 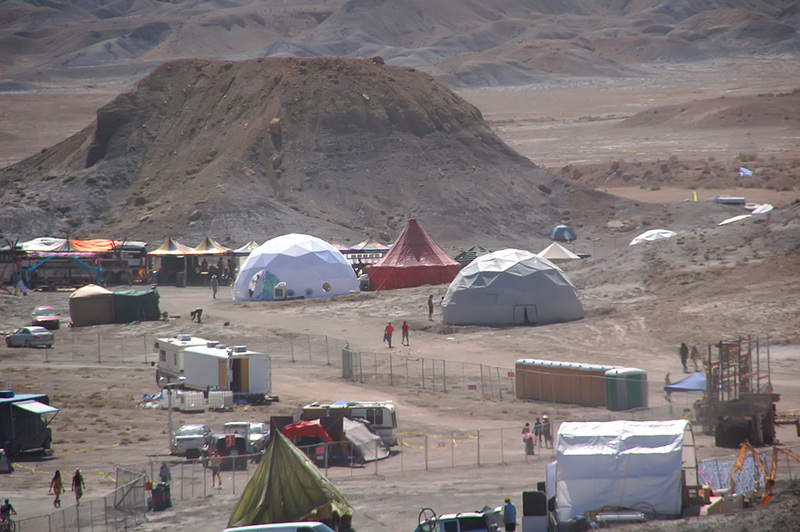 Even though Sunday wasn't the last day of the festival, people were tearing down their camps all around us when we awakened. The amount of broken gear was astonishing. The port-a-potties were even blown over in the night! Our band friends said that they've never left a festival early but they were getting out of there as soon as possible. Since we had planned to leave Sunday so we weren't away from the girls too long, we followed suit, packed up, and got out of there before the wind hit again. We had a truly unforgetable experience at Desert Rocks 2012. We intend to go again, and want a different location with some trees and less dirt. If it's in the same place, we would probably pack up some extra things, prepare for the dirt and wind, and go anyway. It was that inspiring!